The apex predator. Key West waters are loaded with sharks. Join us on a shark fishing adventure that you will never forget. We fish for them in the backcountry in less than 10 ft. of crystal clear calm water. Up close and personal with sharks from 5 - 350 lbs! We fish for them any way you chose. We Practice catch and release --- We do not Kill sharks don't ask.. The Shallow Water Monsters shark fishing charter is a Dream Catcher Charters signature fishing charter and was made for the Predator hunters in all fishermen. This shark fishing trip was designed to go after all predators and work the way up to food chain and for a grand finale catch Sharks. Sharks of all shapes, sizes and species all in less than 10 ft. of water. 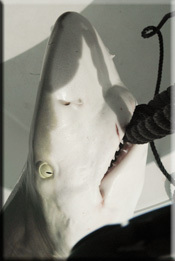 Shark fishing charters can be done on any day of the year. Extreme heat and extreme cold are the to major factors in the sharks. Our day Starts off by light tackle fishing for the lower end of the predator scale by Barracuda fishing with top water and sub surface plugs. This will be our bait. (We also bring along bait we have been saving for shark trips as well). Along the way we will catch some blue runners, blue fish, jacks and other species that really bleed allot to make our way further up the food chain. There are few things more heart pounding than watching a 300 pound bull shark chase a Live Blue Runner to his death. I just never get used to that. Once you are hooked up we provide a fighting belt for you to comfortably use the larger shark rods. Be patient as sometimes sharks take a while. We offer 4, 6, and 8 hour shark fishing trips. Please see our rates page for costs. This fishing charters is great for all ages and skill levels. We provide all gear, bait, ice and bottled waters. We use all Daiwa fishing reels for our shark fishing. Fishing for sharks takes specialized tackle that is up to the task of taking a big angry fish down, safely for you and him. The tackle we use has been adjusted through the years for advantages both ways. We offer belts and harnesses that fit all sizes. We do not use Gaffs or do we try and put these fish in our boat if they are over 60lbs. Catch and Release is utmost important to keep up the survival of the species and our numbers here in Key West, Florida. We try to use the lightest line possible. We use steel hooks only and monofilament line to absorb shock. We also cast for them with top water poppers lined with barb less steel hooks on spinning rods. Boat rods are used generally for larger fish and live baits. Pre rigged leaders that are made right here in our shop. Fly fishing Key West is a blast. Never thought a shark would eat a fly? They love the fly. We get one close by in the chum and get him worked up with a popper then you present your fly. He eats it and you hold on. Its a great way for new fly fishing anglers to catch a big fish.